One of the most convenient and important features of your Honda vehicle is the advanced technology of the Maintenance Minder System. The maintenance requirements for your Honda are determined by an internal algorithm, which considers the engine starting temperature, driving distance and engine revolutions per minute (rpm). The on-board computer also judges your driving conditions and habits, and then calculates the remaining engine oil life, displaying it as a percentage. The technology of the Maintenance Minder System allows you to enjoy your Honda without the worry of when you are due for your next servicing. By relying on the Maintenance Minder System, following both the factory and dealer additional recommended services you can ensure that your vehicle is receiving optimal care and your investment is well protected. To locate your maintenance minder please look on the dash as each Honda model varies. 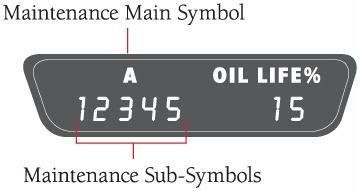 Shows Maintenance Main Symbol (alpha) as well as Maintenance Sub-Symbols (numeric). Preventative Maintenance are steps taken to keep your Honda in optimum condition essentially by servicing your vehicle on a regular basis you are enhancing and preserving the reliability of your Honda. Preventative Maintenance includes things like equipment checks, lubrication, cleaning, adjusting, oil changes and replacing minor parts before a problem occurs. Preventative Maintenance helps avoid costly breakdowns. The regular scheduled service of your Honda is an essential part of Preventative Maintenance. What are the values of Preventative Maintenance? Allows for peace of mind, worry free driving knowing your vehicle has been serviced by the experts. What is Service My Honda? Find complete descriptions and photos of services performed.